Consumers own the service lines that connect them to the Network Waitaki distribution network. 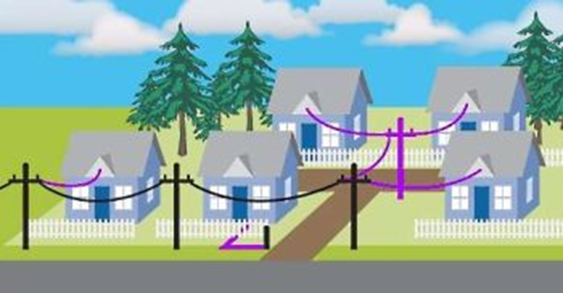 While the majority of service lines are low voltage (230/400V) they may also comprise both high voltage (11,000V) and low voltage lines. Many consumers also own sub-main lines that run between their main installation switchboard and a building such as a detached shed, garage or workshop. The ownership boundary between the Network Waitaki distribution network and the consumer’s service line is defined as the Point of Connection (POC). The POC means the point at which the consumer’s lines, fittings and equipment connect to an isolating device (typically a fuse) on the Network Waitaki distribution network. The following diagram shows typical POC boundaries for LV reticulated installations, with the consumer-owned service lines coloured magenta. We reduce the load on our network during periods of high electricity demand or when we are requested to do so by other market participants, such as Transpower. Load management is done by sending a signal from our control room to switch off hot water heating to reduce the amount of electricity being used. When power demand decreases, we send out a signal that switches hot water cylinders back on. Network Waitaki does not survey service lines, so you need to arrange to have your lines maintained yourself. Electricity lines are dangerous – any inspection or repair work must only be carried out by qualified electrical workers. Never do the work yourself.